Attention: Size of the download is 90GB, so the download can be extremly time consuming. You can alternatively order the library at Best Service on USB sticks. To exploit the full potential of your Dimension Strings (Divisi sections with flexible groupings, Instant Human Performance Control, Polyphonic Legato and the Auto Playback & Pattern Sequencer) you should also own Vienna Instruments PRO. Vienna Dimension Strings opens a new chapter in the history of sampling technology. The recordings in Vienna’s famed Silent Stage started as early as the fall of 2008. 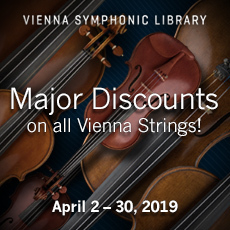 With a total of more than one million samples for the full library, it is by far the most ambitious and intensive production in the history of the Vienna Symphonic Library. To put these numbers in perspective: Since the foundation of the company, 12 years ago, the Austrian company has published more than 1.5 million samples, covering nearly every instrument of the symphonic orchestra and more. The 24 string players of Vienna Dimension Strings were recorded in homogenous groups (8 violins, 6 violas, 6 cellos and 4 double basses), capturing all of the human interactions and slight imperfections of a live performance, but this time the Vienna team has used individual microphones for each player, which allows you to access each voice individually. They have even recorded each string of each instrument in its full range (approximately one octave plus a fifth), and with the included presets you may easily decide whether to have the musicians play on all strings (with a change to the next string in fifth intervals), or forced playing on a certain string. You can also choose to play with no open strings. Getting a darker or brighter string sound has never been easier and more flexible. What’s more, the technique of individual miking is perfectly suited for divisi writing as well! For the violins, preset setups for two groups of four players and four desks of two players are provided. Over the last decade, sample libraries have become more and more “perfect”, sometimes at the expense of human feel. In reality, even the best musicians never play in perfect unison; one makes a change a little slower, another faster, but maybe with more dynamics, and so on. When playing as a group, musicians continually adapt, matching timbre, intensity, vibrato, intonation, bow speed and more. All these interactions happen automatically in a good ensemble, led by a good conductor, and reveal the “magic” of a live performance. With Vienna Dimension Strings, individual changes in dynamic levels of the players within a group can be achieved easily with velocity crossfades. You may even designate one or two “weak” musicians to play sloppy notes, with hesitant or delayed starts, for instance. With the Vienna Instruments PRO player and its Auto Humanization feature, all kinds of nuances and variations are possible while simply playing on the keyboard, making the final result sound absolutely striking. Check out the complete list of features and don’t miss the detailed interview with Herb Tucmandl, the mastermind behind Vienna Dimension Strings. Also, make sure to watch the informative Video Tutorials! Four string sections of 8 violins, 6 violas, 6 cellos, and 4 double basses. Over 300,000 violin samples – up to one million samples for all four sections! Three different sustains: Vibrato, non-vibrato (fully controllable via crossfades!) and espressivo/progressive vibrato (increasing the vibrato to maximum intensity). Legato Performances, Portamento Performances, Trill Performances (legato, marcato), Repetition Performances (legato, portato, staccato, spiccato, various crescendos). Various tremolo variations: Normal, with fast attack, and "slow-motion tremolos". Pizzicato, snap pizzicato and col legno. "Harsh” articulations: Brutally forced fortissimo sounds with short articulations, included as the loudest velocity layer with Repetition Performances of staccato, portato and spiccato playing techniques. Finger noises as separately recorded sounds from shifting positions on the fingerboard make for a more realistic sonic impression in combination with single note samples. Various ambient noises, recorded for each individual player, such as breathing, positioning/depositioning of the instrument, chair noises when leaning back and forth, browsing sheet music (in three dynamic levels!). Ready-made presets for selecting the individual strings of each player of a group –“force strings” (all notes will be performed on the preferred string, e.g., for the violins: G, D, A, E), “avoid open strings” and “use open strings”. Perfectly adjusted vibrato/non-vibrato articulations with unlimited crossfade possibilities (available for sustains, Legato and Portamento Performances) – for an ideal sonic impression, especially in quiet passages. Mix articulations within the ensemble (e.g., desk 1 with vibrato, desk 2 without vibrato). Free positioning of individual players or desks on a virtual stage (e.g., when using Vienna MIR PRO or Vienna MIR PRO 24). Extensive Phrase Archive (host-tempo-sync´ed) for Vienna Instruments PRO’s internal APP (Auto Playback and Pattern) Sequencer: Runs, trills, arpeggios, phrases in all scales and modes, with optimized phrasing randomization of each player. Standard Library includes basic articulations such as staccato, short détaché, sustained (with vibrato), fortepiano, sforzato, tremolo (normal, sforzato), pizzicato, Legato and Portamento Performances, Repetition Performances (legato, portato, staccato, harsh), finger noises on the fingerbord as well as ambient noises (positioning/depositioning of the instrument, chair noises, browsing sheet music, and more). * Your purchase of Vienna Dimension Strings entitles you to download the free Vienna Instruments software player. By using the optional player Vienna Instruments PRO with its Polyphonic Legato and Auto Humanization features you’ll make the most of Vienna Dimension Strings. "Capable of intimacy and grandeur, this library promises to be the most user-configurable sampled string orchestra on the planet, and an orchestral control freak's dream"
Summary: While the degree of control on offer here may be uneccesary for newbies and casual orchestral sample useres, Vienna Dimension String's enormous depth and flexibilty, coupled with its fine musicianship and forensic sampling, will be warmly welcomed by professionla composers, arrangers, mock-up artists and musical control freaks! Die Dimension Strings bieten eine bisher bei Sample Libraries nie dagewesene Kontrolle über die einzelnen Instrumente in hervorragender Klangqualität. Sie ermöglichen Arrangierabeiten wie sie für ein echtes Orchester gemacht werden. Man erhält hochwertige Soloinstrumente, die zusammengenommen einen homogenen Ensemblesound bilden oder ein kleines Orchester innerhalb eines Orchesters sein können. After purchasing the Standard Library, I have waited few days to purchase the extended upgrade...all EXT articulations make the difference! Excellent! you can taylor your string sound in hundreds of way. Very easy and funny with Vienna instrument and Vienna Ensemble interface. Highly recommended the Vienna Instruments Pro to take most advantages from Vienna Dimension Strings power. Du VSL ! Composer pour un pupitre est important dans la musique de film. Dimension Strings est précis et vivant !